The Mesquite Flat Dunes in Death Valley are surrounded with mountains on all sides. Shortly after sunrise the sun is producing amazing shadows. It looks almost abstract. George Lucas has shot some scenes for Star Wars in this area. 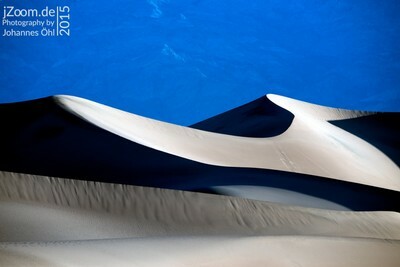 The photo was taken at mesquite flat sand dunes at Death Valley, CA. To take this picture I had to get up very early in the morning at 3am. My hotel was at Lone Pine, which is outside of the national park. Originally I wanted to see the sunrise at Zabraskie Point, but the drive was longer than expected. So I arrived at sunrise at Mesquite Flat Sand Dunes and I stayed there. The photo was taken about half an hour after sunrise. This photo is full of contrast. I had to get the right balance, that the shadows are not completely black. I used my Nikon D800 with my tele zoom lens Nikon AF-S 4,5-5,6/80-400 G ED VR. The 400mm creates a condensed view. The long, deep and sharp shadows where fascinating me. Also the patterns made by the wind are very interesting. With the 400mm lens I could create this condensed view with the blue mountains (this is not the sky!) in the far distance. I used NIK viveza to maintain the light on the photo. The problem is, that even in the morning the sun creates a very bright light. The deep shadows are the other challenge. To balance this out post processing was needed. Usually I am using my Nikon D800 with Nikon AF-S 4,5-5,6/80-400 G ED VR, an 20 years old Nikon Micro Nikkor 105mm 2,8, an Nikon 50mm 1.8 G and an 20 years old Nikon 28mm 2.8. This covers almost everything. Sometimes I have a tripod and a Metz flashlight with me. If you want to take photos in the desert the worst time is daytime, because the sun is steep and creates no shadows. Do it at sunrise or sunset, then you will get the most powerful images.